Some time back on 3 April 2011, a small 'ground-breaking' ceremony took place at the open space next to Block 124, Tampines Street 11. 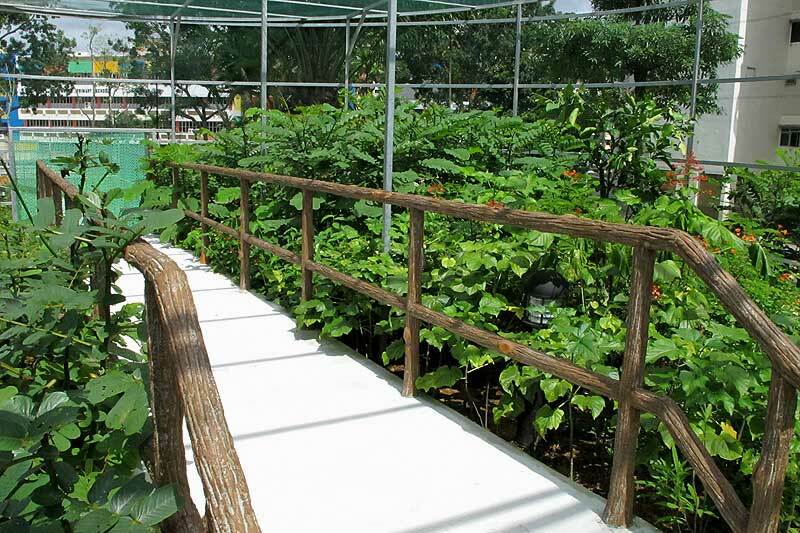 The ceremony was for the community residents to be introduced to a new butterfly garden. 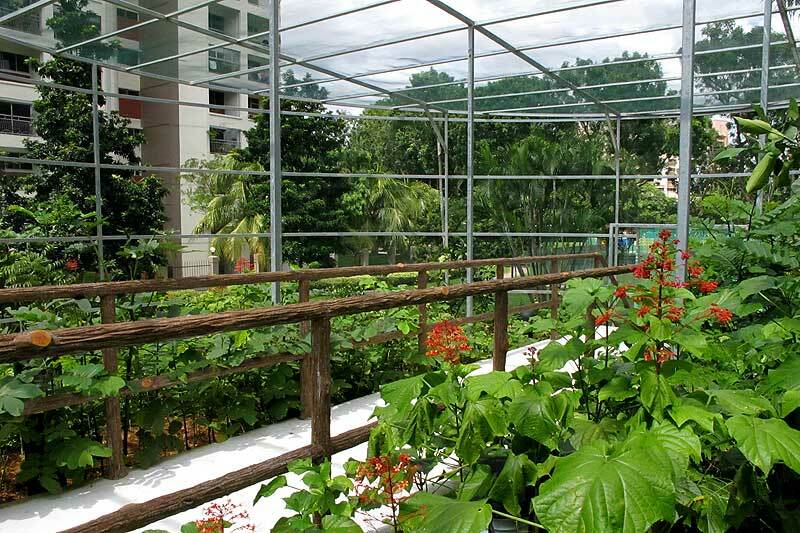 The brainchild of the Member of Parliament for Tampines-Changkat, Ms Irene Ng, the butterfly garden would be a new eco-friendly initiative to create a butterfly-conducive habitat for residents and nature enthusiasts to enjoy. 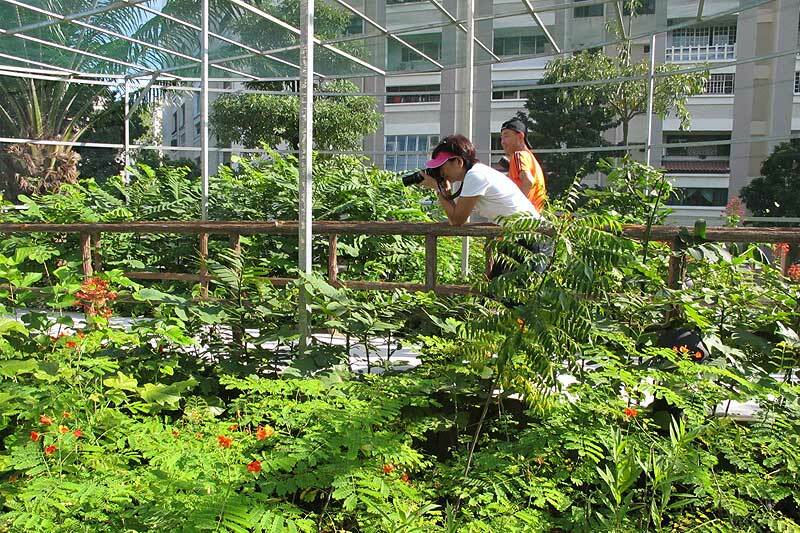 Noting that "there are few butterflies around Tampines as they are sensitive to fogging and pesticides" MP Irene Ing said that the butterfly garden is intended to create a natural setting with butterfly hostplants and nectaring plants to attract these flying beauties to this little patch of green amongst the residential blocks. As the butterfly garden and the construction of a circular enclosure took place, the community centre's staff and a group of enthusiasts from the Residents' Committee realised that they were not familiar nor knowledgeable enough with the ecology of butterflies to attract them to the proposed garden. One of them approached me to give the community members and enthusiasts a talk about butterflies. 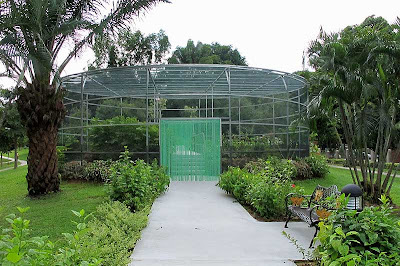 When I visited the new butterfly garden that was under construction, I noted that there were a few improvements that could be made to the design of the enclosure. 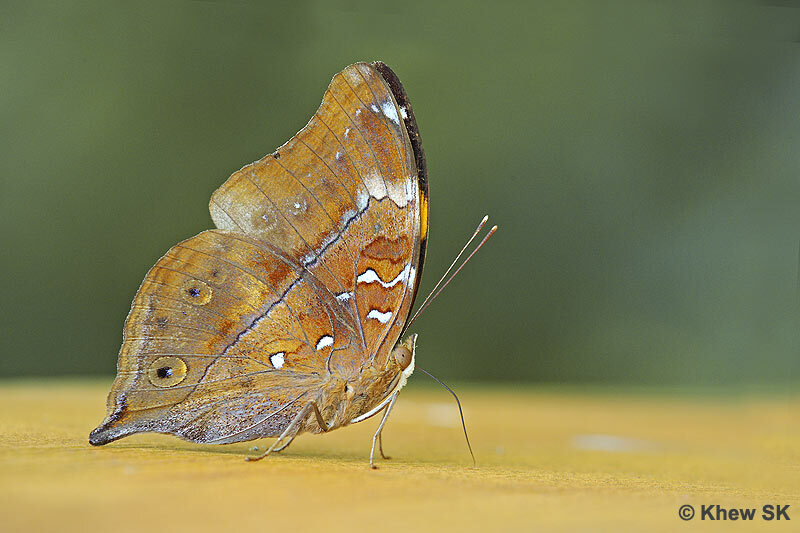 For one, due to the flat top design of the circular enclosure there were 'angles' that would trap the butterflies within the enclosure. 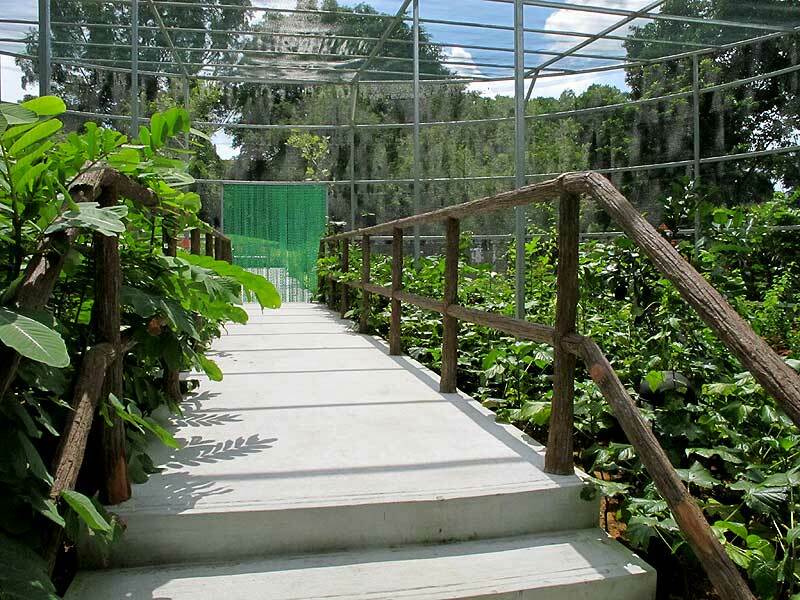 Another oversight was a stepped concrete bridge that allowed an elevated platform within the enclosure. This was not particularly handicapped-friendly. However, as the construction of the enclosure was already at an advanced stage, there was little that could be done to improve the design. 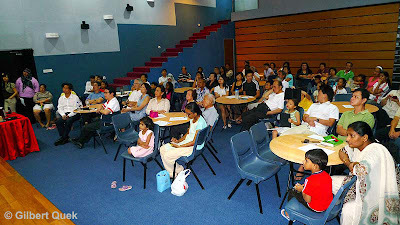 On 23 Sep 2011, I conducted an introductory talk about butterflies at the Tampines-Changkat Community Centre's hall. I was pleasantly surprised at the rather good turnout of about 80 residents and enthusiasts, many with their children in tow. 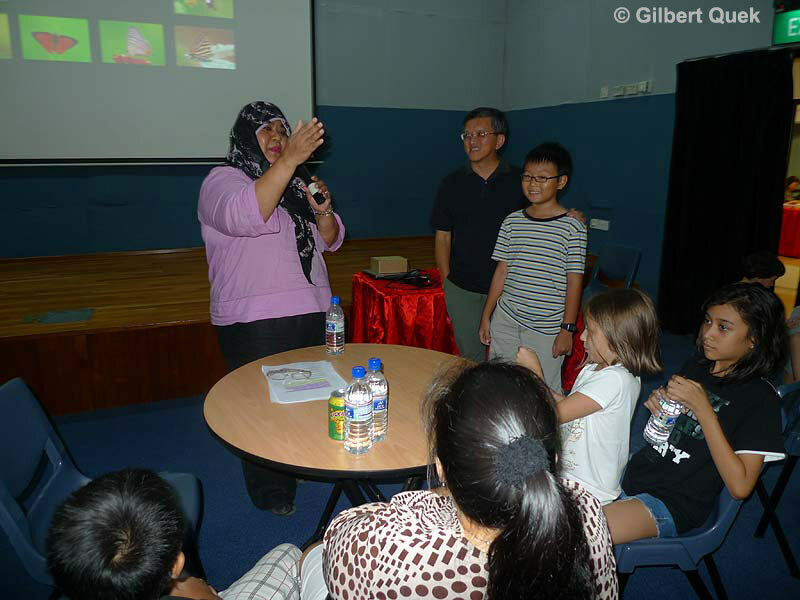 There to grace the occasion, was the MP for Tampines-Changkat, Ms Irene Ng, and her husband, Graham Berry. The attentive crowd was entertained by the many new facets about butterflies that they weren't aware of. 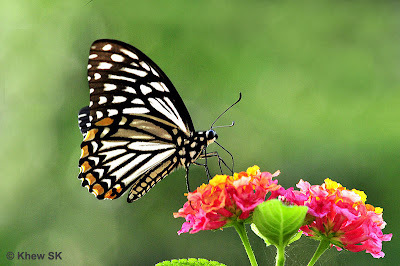 And they also learnt not to kill off the 'ugly-looking' caterpillars that would one day turn into beautiful butterflies! 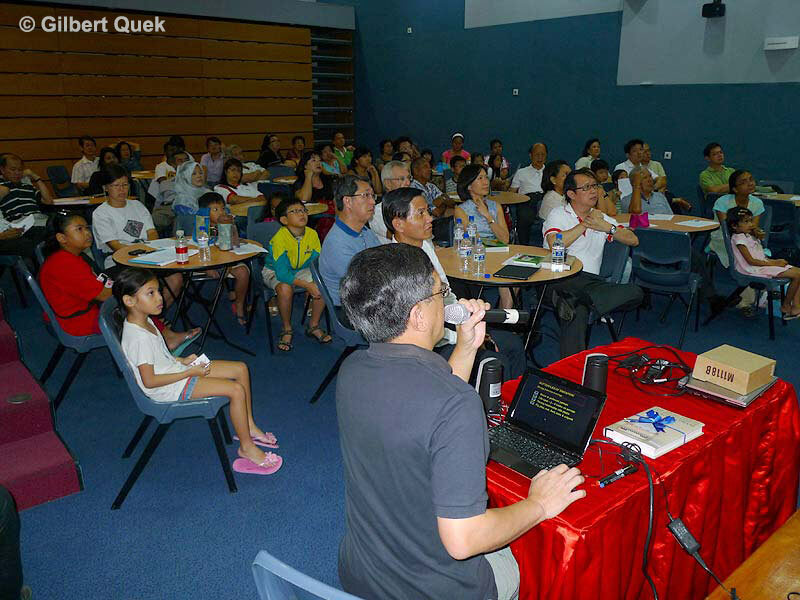 At the end of the talk, there were many questions from the residents, and Brian Goh, ButterflyCircle's youngest (but very knowledgeable!) member, sportingly helped to answer some of the questions. 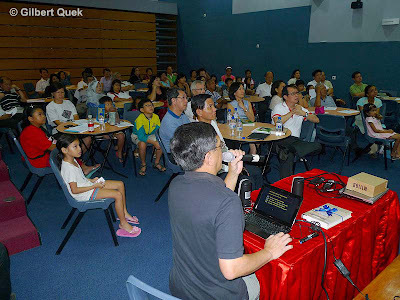 He impressed the crowd with his knowledge about butterflies - even at his tender young age! Before Irene left for another function, she presented me with an autographed copy of her recently-launched book, "The Short Stories and Radio Plays of S. Rajaratnam". Of course, I reciprocated her generosity with a copy of my book in return. For those who did not know, Irene is also a fellow-Penangite. 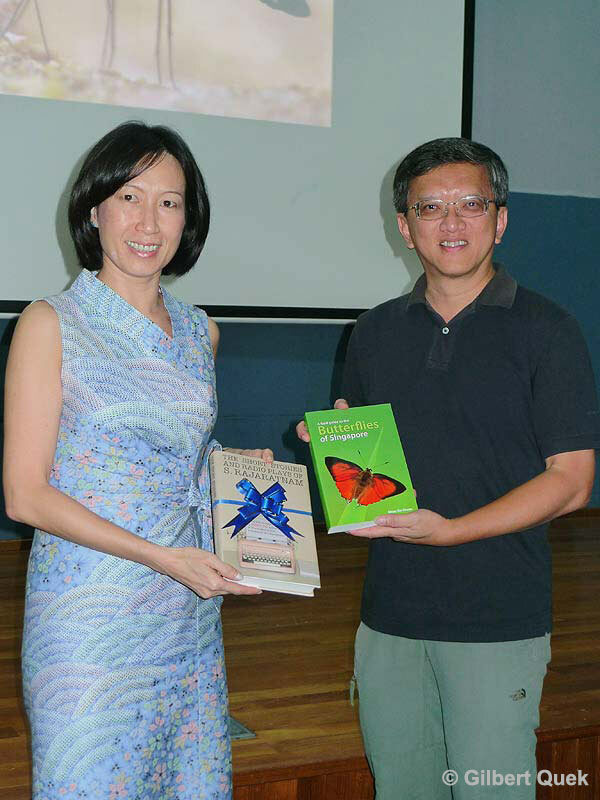 Before joining politics, she was the Senior Political Correspondent of The Straits Times. Irene has won several journalism and writing awards. She is currently the Writer-in-Residence at the Institute of Southeast Asian Studies, besides being a Member of Parliament with a very busy schedule! 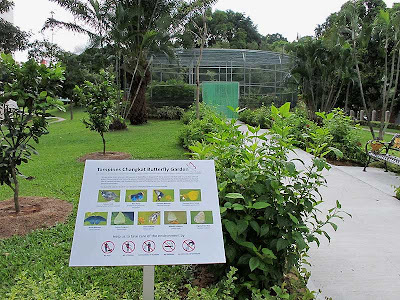 With help from the National Parks Board, the right balance of host and nectaring plants was selected, and coupled with tender-loving care from a few enthusiasts amongst the Tampines residents, the little enclosure is now teeming with butterflies. Although the netting material of the enclosure is unsuitable for smaller species of butterflies, it does well enough to contain the larger and more showy species. 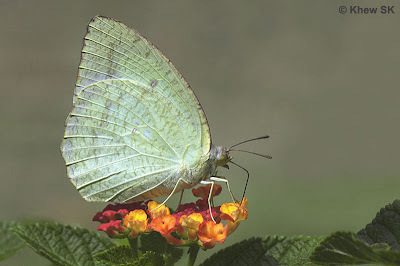 When I visited it recently, there was quite a decent amount of butterfly activity with the common urban species like the Mottled Emigrant, Common Mormon, Plain Tiger, Autumn Leaf, Common Mime, Great Mormon and Common Grass Yellow flying and feeding on the Lantana and Pagoda Flowers. 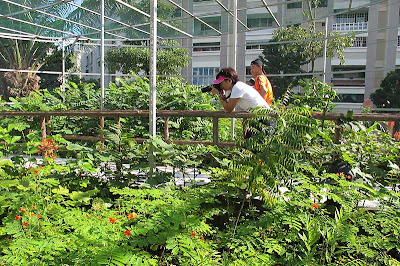 There were even a couple of photographers who told us that they came all the way from Toa Payoh after learning about this new Butterfly Garden at Tampines! I hope that the external areas around the enclosure can be expanded with more plants and walkways so that more butterflies will visit the area, so that visitors can enjoy free-ranging butterflies, and not just those that are flying within the enclosure. It was encouraging to see that many enthusiastic residents of the area were already helping to tend to the plants and also breeding various species of butterflies to release at the Butterfly Garden. 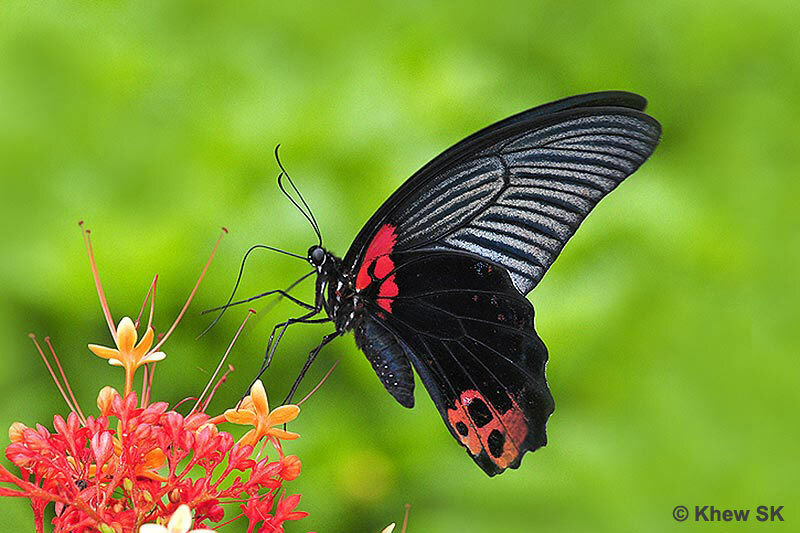 So here we have, thanks to MP Irene Ng, a new community garden for butterflies at Tampines, and for the residents to enjoy the beauty of nature's flying jewels! 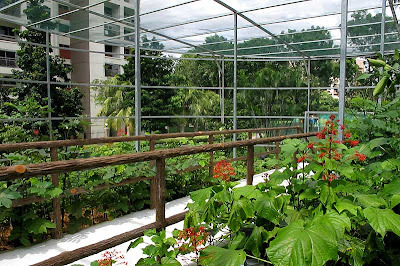 It will hopefully be another shining example of community gardens within the heartlands that would encourage other constituencies to set up their own butterfly gardens to encourage the conservation of Singapore's butterfly fauna. As Mr Khew said : "I hope that the external areas around the enclosure can be expanded with more plants and walkways so that more butterflies will visit the area, so that visitors can enjoy free-ranging butterflies, and not just those that are flying within the enclosure." You are right Mr Khew. I donot wish to see butterflies been 'prison' in the enclosure. Perhap one day we could remove the chain curtains. You're right, TK. It's more challenging to have a free-ranging butterfly garden, but more satisfying. It's always great to see butterflies flying freely in their natural environment!